Giving kids an allowance shouldn’t be the first and only step one takes to teaching kids about financial literacy. Kids should be given a chance regularly to earn money in order to learn how to manage it, including saving it. 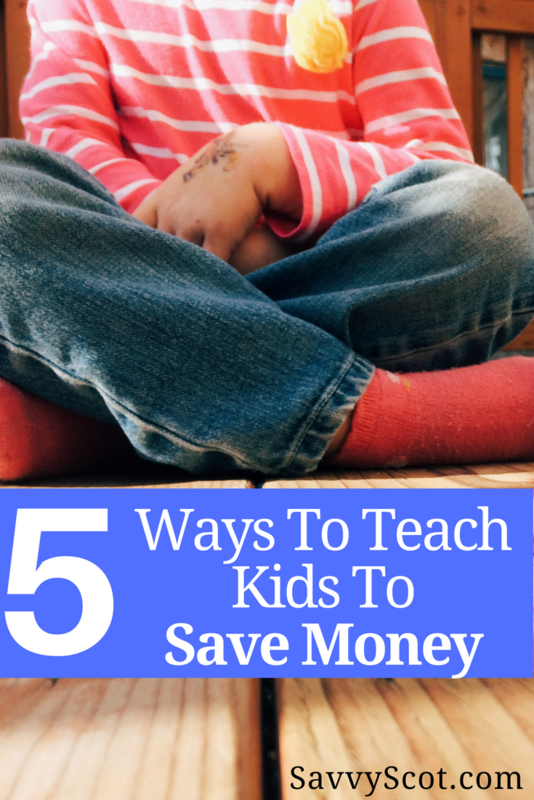 Here are 5 ways to teach kids to save money. Giving kids money is great, but what do they hope to achieve with that money? Having a goal in mind helps with saving. Sit down with your kids and ask them what they plan on purchasing. Knowing what they want to buy will reduce the chance of them prematurely spending the money. If they don’t have something in mind, set a number goal for them to reach. Having a clear goal in place keeps them on track to saving money. Not only will it teach them about saving, they will learn discipline too. If you child has a hard time with wanting to spend the money they get, consider an “out of sight, out of mind” approach. When money is into an account versus a piggy bank in their bedroom, it is harder for them to access, making spending it less likely. Open a savings account for them and using their goal as a guideline, deposit enough money to help them reach their goal, while still giving them some spending money. Kids aren’t good at delaying pleasure. If all of their money is going into savings, they may not find pleasure in earning money. Kids enjoy the thrill of a purchase, but also enjoy seeing money next to their name. When they have an account with money next to their name, it is motivation to continue adding money and letting them keep some spending money give them the best of both worlds. Strike a deal with your kids. For every £5 they save, you will give them an additional £0.50. Or, every time they save instead of spend, give them a small monetary reward. Keep in mind that while rewarding them is okay, you should not punish them for choosing to spend. Focus instead on teaching them in a positive manner. They will quickly learn that saving is more beneficial than spending. And when kids think something is their idea, they are more apt to doing it. Teaching kids to save up for what they want is important, but not always realistic. If a child wants something that is expensive, you can agree to help them purchase it by matching their savings in part or whole. This is different than paying them interest in that they must save the entire amount agreed upon before you add your matching amount. If your kids see you saving money, they are more likely to save themselves. Take them to the bank with you when you deposit money into your savings. Let them help with the budget to see that saving is a part of budgeting. Say “No” to some purchases and save the money instead. Kids follow whatever example they see, so setting a good example is important. Finally, make saving fun in order to entice your kid to save more. If they have siblings, make it a competition amongst them who can save the most within 3 months, or who can save £50 the longest. The bigger the role a kid has in managing their own money from an early age means setting them up for success later on. Help your kids succeed by teaching them to save money. Some great ideas here! Though I don’t have children yet, my parents did a lot of these habits for me. I always had savings, so it not only taught me about money from a young age, but I was able to grow my savings account to a decent amount, which was cushion after I graduated college! Good tips … many parents simply teach dependence by giving an allowance. The other suggestions supply the other pieces of the puzzle. I got so excited at the thought of having a savings account as a kid. I started saving all the money that I got during my birthdays and other holidays. I’ve taken that mentality from childhood all the way to my adulthood and it’s really helped. This is a really important message to send across to our kids. We all want what’s best for them and to give them this responsible can only be a good thing. Great post Pauline and thanks for sharing.